One could believe it must be Christmas: I have another giveaway for you, yay! 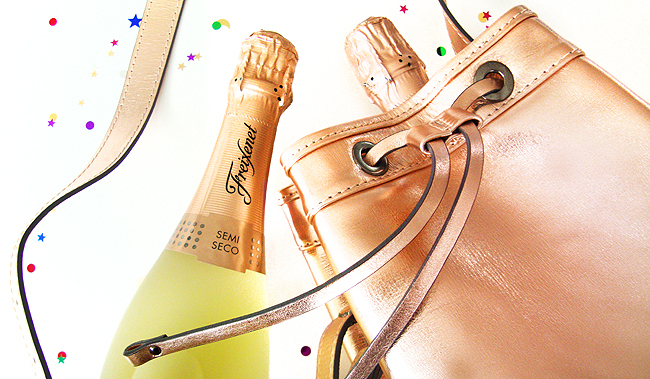 And not just any other giveaway no, but you can win a very exclusive Michael Michalsky bag in trendy rose gold and two bottles of Freixenet Cava. There are only a few of these sets available in Switzerland, so take your chance and have a party! For its 75th birthday, the traditional Spanish label Freixenet is going fashion and asked German designer Michael Michalsky to create a special edition for their bottle. The designer inspired himself in Spain, visited the Freixenet winery and the local production of the sparkling wine. Freixenet and Michalsky share their high-quality standards and tradition, as well as a unique design and style. The result of the joint venture is an elegant and classy bottle for the fizzy wine drink. 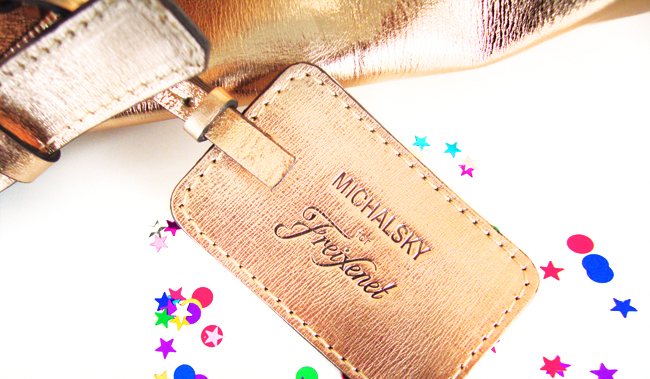 The dots on the bottle remind of studs, an essential element of Michalsky's signature style. They appear on the metallic bag as well and make it an eye catcher. I fell in love with this bag as soon as I opened the box and the greedy part of myself wishes to keep it. But as my lovely reader, you deserve a unique piece so much, and I am euphoric to make the bag dreams of one of you come true. How to win: All you need to do is to comment below this post and tell me what would be the perfect party for you and leave me your mail to contact you in case that you win. The giveaway is open to residents of Switzerland only and will end on the 2nd of October 2016. Good luck to everybody and cheers to the winner! Awesome!All i need for a great Party are my best friends!Thank you for the Chance to win! What would I need to party??? 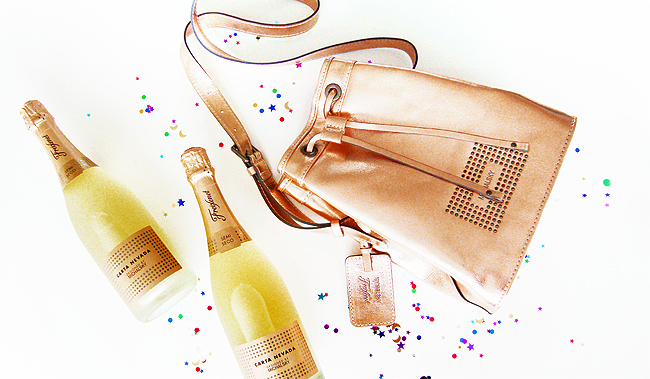 This bag and some Freixenet...lol! No, honestly the bag is great and I would be delighted to win it. But for a good party the most important element are the right people...my dearest friends!!!! Hi Lovely Sara! I kept thinking a lot about your question and what to answer, to be honest. But in the end, it is that easy: The perfect party can be anywhere on the planet, but my friends and family have to be there and music to sing along all night! So a karaoke corner is a „must have“ to make my party perfect! There is nothing better than laughter and to get the giggles with good friends. Thank you for giving me the chance to win such a cool giveaway! 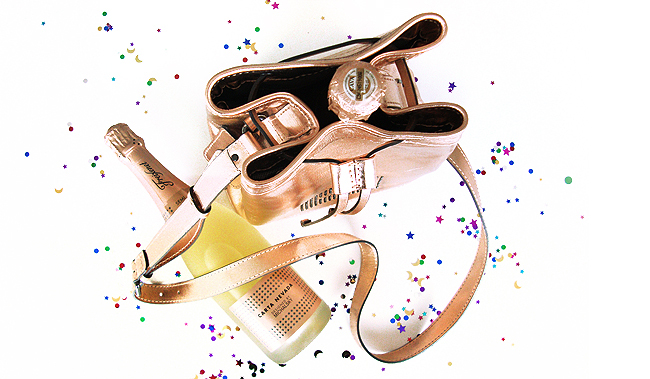 PS: The karaoke winner’s price would be a bottle of Freixenet! Hi Sara! For me, the perfect party would be around a pool, decorated with rainbows and glittered confetti. An inflatable unicorn swims around carrying the bottles of freixenet for all the guests. Thanks for giving me the chance to win this lovely giveaway! This colors match perfectly, thanks for this idea. If to be hones I am really bad at choosing presents, but this web source was very useful for me.